Massachusetts is considered a “two party consent” state with regards to wiretapping laws. This means that you can record calls, you just need the permission of all parties on the call. The law applies to recording a conversation whether or not it is in-person, or it’s taking place via telephone or any other medium. According to Mass. Gen. Laws ch. 272.99, it states that you must obtain the consent of all the parties to a conversation of a telephone call before making a recording. You may only not do so when it is apparent to everyone involved that the recording is not a secret. If a party to a conversations is notified about the recording and they don’t wish to be part of it, they are at liberty to leave and not be part of it. However, if after giving notice prior to recording, then no one objects or leaves the communication, it will be implied that all parties consented to the recording of the conversation. The law also covers secret recording of videos when audio is also captured. Recording calls without the consent of all the parties in Massachusetts might lead to criminal prosecution since it is in violation of the wiretapping statutes of the state. If one is found guilty, they may be exposed to civil lawsuits. They may eventually pay damages to the injured party besides incurring the costs of attorney as well as the litigation services. 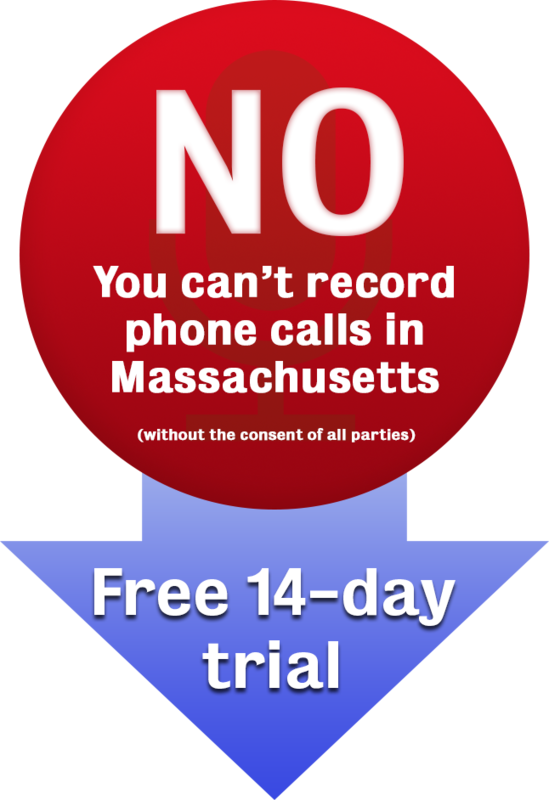 If you have the consent to record phone calls in Massachusetts, then you are at liberty to use any legal means at your disposal. The law is not very explicit on the gadgets or the equipment that can be used to do so. With Secure Speak, we give you a phone number that you can 3-way into any call. Whatever that line hears gets recorded, and sent to you via email when the call is finished. We’re currently giving away free trials, so signup now so you’ll be ready to record any inbound or outbound call when the time comes. Secure Speak is not a licensed lawyer and any statements do not constitute legal advice. Contact a lawyer for information pertaining to your specific case, and reference Mass. Gen. Laws ch. 272.99 directly.